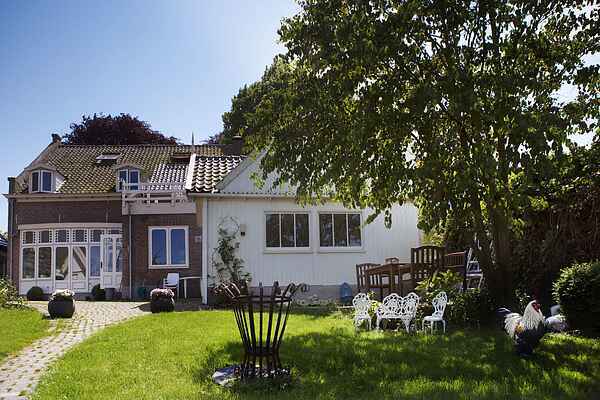 In the rural village of Oostwoud, near Medemblik and the IJsselmeer, lies the authentic nineteenth century holiday home De Pastorie. Massage shower, sauna and wood stoves, they're all there! The spacious backyard borders on a waterway. The charming harbor town of Medemblik and the famous IJselmeer are nearby. You enter the Rectory through the long hall with original ornaments on the ceiling. De Pastorie is classically and stylishly decorated, you could almost feel like you are in the 19th century! In the living room there's a Chesterfield sofa, a leather armchair and a romantic wood stove. There's a beautiful painted statue of Mary in the house and there is a piano, \"Who will play Mozart tonight?\". In the conservatory, you can read a book undisturbed. And for the nights there are beautiful bedrooms where you can sleep like a log. In the spacious garden there are several seating areas and an outdoor fireplace, so you can always find a sheltered spot to relax. With the six-person motorboat, you can take a ride through the fields towards the nature reserve Egboetswater (also within walking distance) and the Vlietlandenmeer. You can even go further, to Medemblik and the IJsselmeer. The charming harbor town of Medemblik and the IJsselmeer are within a ten minute drive. During your stay, you can also visit the historic shopping cities of Hoorn, Enkhuizen, and the cheese town of Alkmaar with their picturesque squares and terraces. In the village of Oostwoud itself you'll find a sauna and wellness complex with a beauty salon, a three minute walk from De Pastorie. At the end of the street you'll find an outdoor pool. At the IJsselmeer you'll find a nice playground, a petting zoo, miniature golf, an indoor pool, and a golf course (18 holes).